1001 gadget for your PC. 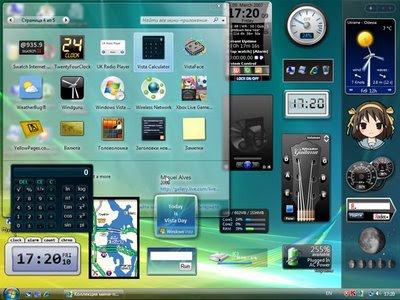 Gadgets are used to display useful information on the computer and the Internet. The compilation contains gadgets: horoscopes, clock, weather, postal service, the PC switches of all kinds. Additionally, the presence of information gadgets, informing the user of the system: HDD, able to network and Wi-Fi, state of the computer, operating system, RAM status, and many other interesting gadgets that are just needed for comfortable work on your PC.